New Staircase Carpet: A Decorative Boo-Boo? Oh. Although I have mixed feelings about the carpet, I absolutely adored Lisa and John Cockx, the couple who installed it. First, Lisa and John removed all of the old material from the stairs. I loved that old carpeting, but it had become threadbare after 16 years. Also, it showed every speck of lint and dust, just as all boldly-hued carpets do. 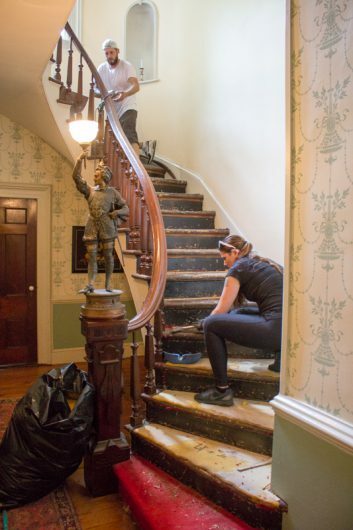 Next, the padding was removed from the 19th-century steps. The new padding is far superior to the old. Looking at the above photo, you might wonder if I considered restoring the wood, and going without any carpeting at all. The answer is yes. But if I’m going to fall on stairs, as I am prone to do, I want them to be cushy stairs! Then came the worst job of all: removing myriad carpet tacks, and scraping away residue from the old padding. On a side note, let me just say that I loved Lisa’s shoes and leggings. She’s a stylish girl. While I cooked and photographed my latest step-by-step recipe, Lisa and John installed new, superior carpet padding. Then, one step at a time, the new carpet was cut and installed. The carpet looks wonderful here, because it is at the top of the stairs, near the big arched window. Side note: John has a cool tattoo on his right arm. 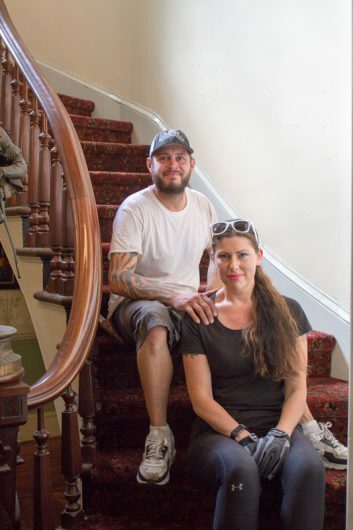 If you live in New York’s Capitol District, and you need carpet installed, I suggest you contact Lisa and John. They are masters of their craft. From start to finish, the staircase job was accomplished in about six hours. And the less-dramatic (to me) after. True, the lighting is different in these before-and-after photos. But you get the idea. I wonder what Muttka thinks? I removed the runner! And you know what? I kinda like the arrangement. A biscuit for your thoughts. Muttka thinks ‘GOOD CHOICE “, that at least dog hair will not show up now as obviously as before, and thus will feel less guilty about Kevin having to vacuum stairs all the time . 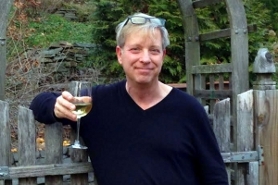 . .
Hi Chris – That’s encouraging! I love it. I hope you will in time. Sorry, I never liked the bright red. I don’t like things that scream Look at me! This darker red looks much more classy and blends in with the other features better. Now you see the railings! Oh, Kevin it looks fine. I wouldn’t have installed it wall to wall fashion. 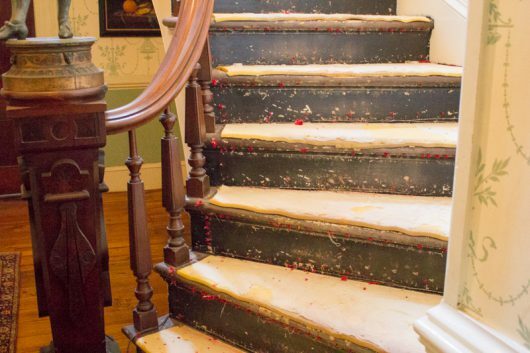 I would have either re-finished the wood stairs or painted them and installed runner fashion. Still it looks beautiful and I am sure you will come to like it…. Honestly, Kevin, I am not sure either. Agree carpeting softens the fall, but I might have redone the wood stairs and used a runner instead. And I love her shoes too. I hope it will grow on you. consider replacing the runner with something a little more dramatic! I think I would have redone the wood and painted underneath each step. No runner. Wood all the way! Very elegant! That’s my 2 cents. Mint green and maroon….I confess I don’t get it. But homes are intensely personal and it only matters that you and your husband love it. Give it a chance and good luck with it! Hi Kevin – that is beautiful carpet. I think it looks wonderful – maybe if you change the floor runner on the hardwood below it might make you like it better. Perhaps pull one of the lighter colours out of the staircase carpet and find a solid-colour runner in that shade. It should make the lighter tones on the stairs pop, and it won’t be a clashing pattern like what’s there now. I like it, but the older I get I find I like things to Blend in more. Looks elegant. I actually like it…..much better than the bright red. Why don’t you try changing the runner? Solid? Not red? So much prettier than the old. The old was just too bright. I probably would have refinished step and used a runner. I love the new carpeting. It looks beautiful on those stairs. Dear Kevin. I love wood too but hear you about stumbling on wood stairs. Muttka would not have an easy time of it either, although runners do help. Having read all the step by step posts about choosing the carpet, in my opinion, the photos of the newly installed carpet really look lovely. You and Mr Fox chose it. How could it not be a good choice? Give it a chance. It is a dramatic change from the bold bright red. Kevin, The carpet is beautiful. I see that it is darker than the runner……so…..change the runner? Can you bring more lighting onto the stairs…..I HATE it when it takes so long to make a decorating decision, then it’s not what you thought it would be…..
Another suggestion here. It looks like the problem is less the color of the carpet than the lighting. It matches the runner nicely at the top of the stairs which have lots of light. It only seems dark at the bottom of the stairs where it is a bit shadowed. Some lighting that brightens up the foot of the stairs just a touch might do the trick. I do like the runner, personally, but then I am very fond of the elegance of oriental rugs, especially in lovely reds. I love your new stair carpet. For me the pattern, especially with red base color, hits the spot. I love seeing the old wood with nothing or just carpet up the middle. But it looks better than the bright red. I actually like the old red carpeting. The new carpet looks dark. Maybe some Lighting would brighten it up. Here’s an idea! Try an ivory or Light beige runner on the Floor! Maybe the contrast would “liven up” the staircase carpet? Try laying ivory beige towels on the floor runner style to get a feel for the effect. Love the new stairs, Sherry was right, that runner is gone, but you need a new runner in its place maybe one that picks up some color from the stairs and wall? A lighter color?a darker color? but what do i know? I totally agree…as I first viewed the finished picture, I did not care for the runner at all. I think a runner that picks up a color from the stairs and colors from the walls would look better…something not so “busy”. Yes I agree with the runner gone it looks heaps better. However, I always feel that a good quality natural wool stair carpet can’t be beat. Brings out the colour of the Newell posts. I think it looks beautiful, and yes, better without the runner. I love it! Especially sans runner! What a difference the absence of that runner makes. I think the hall and stairs are really beautiful. Definitely better without the runner. It was so close in style and tone to the new carpet that they were fighting for dominance with each other. I love the new carpet on the stairs! Sherri had a great idea removing the runner. Now there is no conflict and the wood is spectacular. Much richer looking. Enjoy, change always takes time. Staring intently, I had mixed feelings, thinking it needed something to provide a little more balance on the opposite wall, however, you removed the runner and WOW! It is also my belief that Muttka would be thrilled living anywhere with you two. Sherri is right. My first thought was “WOW its gorgeous….but that runner…..” Looks great without or may I suggest a sisal runner? Kevin, I actually like the stair Carpeting and Runner together. I think they complement each other, however, the hardwood floors in the hall are beautiful and the hall without carpeting looks very nice, as well. I think a runner in the hall helps to warm up the area nicely. Excellent choice and wonderful job! Either way, you can’t go wrong! Outstanding staircase! How about changing the color of the door at end of hallway. Maybe something lighter like I see on the rail of stairway. I still think the carpet looks nice. Love the stairs, love the wood, but I am not wild about the wall color! I can see the cerpet has the green in the walls but it does not show well. I would eventually change the lower color of the wall to a closer blend with the carpet color. A simple way to see if you would like a color is to yake a thin piece of wood laminate that is cheap, paint it the color you are considering, and place it over the wall-lean it in so it is not permanently attached. One can change to color without hanging the wall. I am in theatre and this is how I do sample wal lcolor if in doubt if the hugh. If you decide you need a runner, you have one made to match. In my humble opinion, I think you do need some sort of rug on the floor. Is it possible for Lisa & Mike to make one for you out of the same carpet as on the stairs and maybe use a pretty border? Just an idea. How about a lighter colored pretty elongated oval runner type rug in front of the bottom step and hall table? Something with mint and beige? sort of flowery and happy? Just sayin! Love the idea or hate it!! Thought the runner clashed with the carpeting. Looks great without runner. 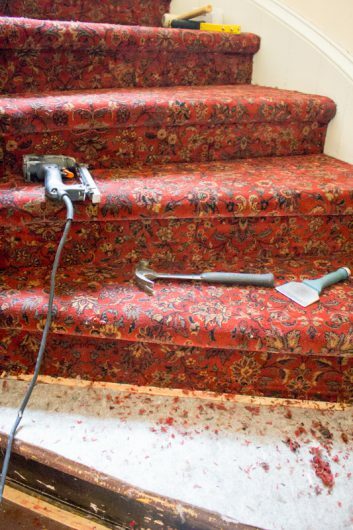 What would happen if you had a matching runner made out of the same carpet you had installed on the stairs? I felt the same yesterday about the runner as your reader who suggested removing it. It does look better but I think you are going to miss a carpet there. When you had the bright red carpet, your runner was darker and more subdued. So I’m wondering if you chose a color tone darker than the current stairs, would it blend and complement each other. Just a thought. I felt the same yesterday about the runner as your reader who suggested removing it. It does look better but I think you are going to miss a carpet there. When you had the bright red carpet, your runner was darker and more subdued. So I’m wondering if you chose a color tone darker than the current stairs, would it blend and complement each other. Just a thought. Almost forgot to add that the carpet looks very elegant. My Aunt Claire, from Germany, owned an upholstery and decorating company in Philadelphia. Her recommendations to clients was to always re-decorate the whole room or grand entrance in this case. Love the new carpet. I think your doggy is missing the carpet to walk on. Hmmmmmmm…… I must admit I never really liked the bright red carpet. But, like yourself, I’m not particularly sure I like the new carpet either. You are right about it appearing much darker. I really liked the swatch you showed us. I thought to myself… Now THAT’S a fabulous carpet pattern and the color is still red but nicely toned down. However, now that I see it installed…. It really does look a little on the dark side. But, I do like the look without the floor runner a lot better. I say live with it for awhile. A few years back I painted my living room a sort of cocoa brown. At first I thought… OMG, what did I do. But now… I love it. Perhaps it’s just a matter of adjusting to the change. I love the stairs and I think it looks beautiful without the runner rug… don’t need it, just another thing to clean or trip over! Kevin, all these posts only serve to confirm how individual decorating taste is! Personally, I love the new carpeting, sans the runner. I do think there is such a stark contrast between the old and the new that you need more time to adjust. I agree that just a touch of additional lighting may improve the area. OK, first and foremost, I want to kiss Muttka on the forehead, she’s adorable! Second, I love your new carpet, it really brings out the beautiful wood tones of the staircase, doors, and floor. And removing the competing runner was genius. The staircase is the focal. Third, I like the contrast with the mint walls. And Fourth, is that a wall nook midway up the staircase? I think something dramatic there would be fabu! It would lead the eye upwards and bring back some of the drama you’re missing. Cheers! And Happy Birthday, Mr. Fox!! Live without the runner for a while and see how you like it. After a time, you should feel that it works fine or feel that it “needs something”. Also, you can use the runner part-time. Or, as some others suggested, get a solid runner in a complementing color, maybe something with a less dense pattern. Have you considered a smaller rug in front of the door? The whole picture without the runner looks good, though. Beautiful staircase. I like the new stair carpet. I’ve never seen anything like it on stairs and it looks elegant. That bordello red carpet you had was a jarring horror to me. And the hall looks larger and much better without a runner. That runner, however, is just what I have been looking for to put in my family room to cover a long crack in the tile from Hurricane Harvey! Long runners are difficult to find. Kevin, you didn’t make a decorating mistake, you improved the hall and stairs. You have long been blinded by the bordello red. You will feel much more elegant going up these stairs now. So very classic and peaceful looking. Invites you to go up the stairs to see what other scenes will please your eye. Nice. 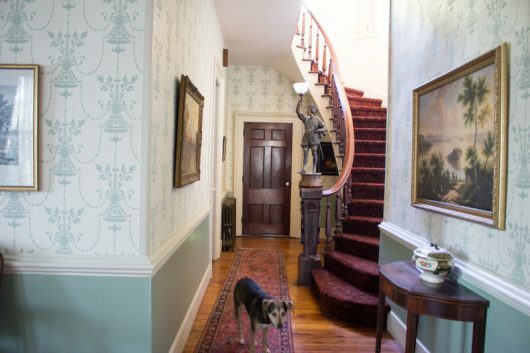 I would put a cream colored runner with burgundy and mint patterns in it – maybe the opposite of what is on the stairs. I think that would better blend all those colors. The stair carpet is much better than the bright red and it certainly matches the decor. One more simple addition could do the trick. And the lighter runner shouldn’t show the dog hairs as much. Love your house! I think what you’re missing is the ‘pop’ the bright color gave the space. Maybe there is a way to add a bright pop in the space in a different way, that would give you the wow you’re looking for? I went back and looked at the pictures several times. And each time I wondered what caused you and Mr. Fox to choose the color you did for the carpeting on the staircase. To my eyes, it just does not go with the mint green lower walls and patterned wall paper above. The carpet is lovely but looks out of place. Any chance repainting and wall papering that area is in the plans or budget? A change of colors could be what is needed. That is what I would do! It could be made smashing! I think it’s beautiful. Your pup probably thinks so too. The whole area is really beautiful. I like your thinking re falling on cushy stairs rather than hard wood too. I enjoy everything you post and love your recipes as well. Beautiful home with lovely owners! I just–after 26 years removed the carpet from the staircase in the front entry. We whooped with JOY when we saw there was pristine finished hardwood under it. I hold on to the railing but I thought the CARPET was actually the CAUSE for any SLIPS/FALLS. Try adding lights along the baseboard of the stairs. 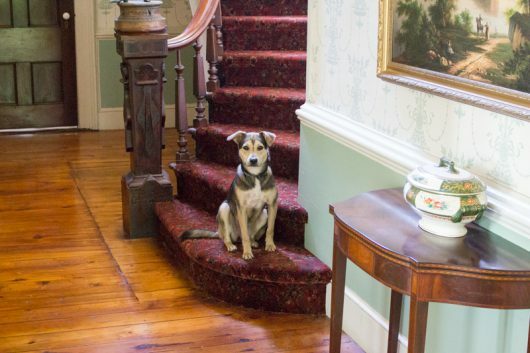 I agree with other comments–I would have only installed a runner on the stairs-because the dog will thank you.. I feel the walls are the problem. The carpet is very warm and the walls cool. The color seems to clash with the staircase. Perhaps you could choose the beige color that is in the carpet for the walls? Just a thought. Personally, I like it very much and especially without the runner. The wood floor now has a chance to show its beauty without being covered up. Enjoy that beautiful new staircase! Oh Kevin! Change is always tough and takes some time….but I feel you and Mr. Fox will grow to love the look. I would add a bit of greenery to just give it a little “pop”, but maybe something with that dark color tucked into the arrangement? And, I agree with the others, Muttka will definitely appreciated carpeted stairs!!! Gotta say – I love it, better than the old! 16 years. Its a darker color and a small floral print, I like the new carpet. that whole area together, its bare without it, like somethings missing. Keep the runner. It balances the color of the new carpeting. I would add that same color in a bouquet of flowers on the hall table. Color in odd numbers is better than even numbers. I love the new carpet…even better than the bright red. If it feels to dark to you, could you add more light? I was wondering if you change the painting on the wall above that table…something that has a bit more of the colors in the carpet…even swap out the one that faces the stairs at the bottom, maybe. Can’t see it exactly. AND perhaps porcelain with the burgundy rather than green porcelain? Keep us posted! The new carpet is just BEAUTIFUL . I love it and so should YOU! The colors are warm and inviting and brings out the coziness of the wood. It’s is a big change from the red carpet but this new one is updated fresh and welcoming. It also has a very calming effect in the eyes. Enjoy your new carpet ; the folks who layed down did an amazing job ! I like the floor without the runner because the wood floors look amazing and add further character to this entrance way. However you can use the runner when your entaining or in the winter months to protect your floors. Take a deep breath and know that you and Mr Fix did s wonderful job!! Enjoy life it’s so precious and each day there is always something to be grateful for..
You were right. Less is more. The runner was too much. The stairs are beautiful. Kevin, I agree with many of the comments : the old carpeting was too bright/garish, the new carpeting is classy and new lighting might help. Perhaps new bulbs with a higher lumen rating is all you need. But to me, as several people suggested, the biggest problem is the green wall color and wallpaper. They are washed out and don’t seem to compliment the new carpet. A new color selected from the beautiful colors in the new carpet would make a big difference. 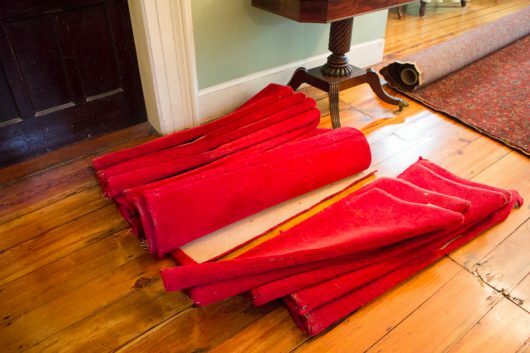 Not being a decorator, I observe that the deep red carpet and the foyer floor are from different color families . . . red vs. orange. Short of refinishing the floor to a shade that leans towards brown, I think that you might find a rug for the foyer that has all the colors you are wanting to pull together . . . not an impossibility in an oriental carpet. Good luck. That’s one beautiful staircase! Love the carpet , and it’s so wonderful to see the bottom runner gone, makes the other stand out much more! Hope you enjoy, have been following your blog on the new kitchen, and hall, etc. some lighting along the wall or from the ceiling mid-way up the stairs? to get an idea of what more light might do? is needed to make it work. Good luck! Kevin, as one who seems to have developed the talent for having very bad falls in my senior years, I can assure you: CARPETING THE STAIRS is a MUST! I can vouch for the fact that bruises are easier to recover from than broken bones! I think the new carpeted stairs looks lovely. I also recommend adding more lighting to the stairway. A hanging light or some wall sconces perhaps? I have found that FALLS do not tend to decrease with added years. You are wise to think ahead. Kevin, as one much more senior than yourself, I can assure you that padded and carpeted stairs are much easier to survive when falling than ones on bare wood. Bruises are preferable to broken bones. (Unfortunately I know this from personal experience). And good lighting is an absolute must. I think the new carpeting looks lovely, by the way! But it’s fighting with the busy runner in my opinion. It calls for something that is more complementaryand less busy. And if you add lighting, the carpets soft colors and patterns will be far more noticeable, too. 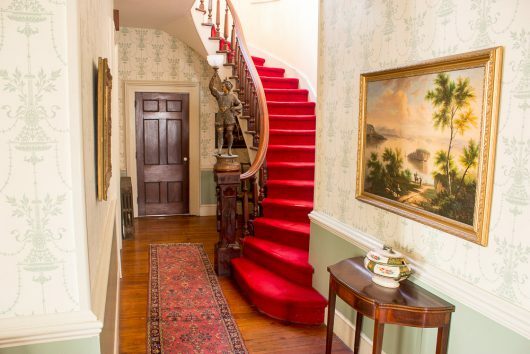 My immediate impression was that now the sweeping and dramatic staircase is what you notice, as part of the whole stunning entryway, not the carpet or color. I am a huge fan of oriental carpets, have many, and love when they are individual and yet coexist nicely. I like the runner with it too. Live with it a while. Like all things new, it may just grow on you. I don’t see a mistake at all. And I LOVE your blog, recipes, videos, humor, and good heart! A rich green patterned carpet, a Color was that coordinates with the color of your beautiful walls would not fight with the over all lightness of the delicate color green and elegant wall paper. Take cues from the paper and walk color. You do not need the strong, heavy saturated reds in the cool light mood you created with the wall color and elegant wall paper. The wood will pop with a cooler geeen and draw the eye up. Up. Up. Add some crystal somewhere to bounce light around the hall. A darker jewele green tone runner will anchor your hallway and go with your art better. Kevin, a more muted, elegant look! Definitely without the runner is better. You have beautiful floors to show and that look compliments the stairs! Good job!!! I love the new carpet with the persian runner. They look very elegant together, and showcase your beautiful wood floors. Just the opinion of an old Charleston, SC, lady who always enjoys your blog. Absolutely love the new carpet with the green on the walls and the dark wood of the doors and bannister. To me, what looks a bit “off” is the orange tones of the floor. Maybe that is just the lighting? Hope you and Mr Fox are loving it now. The carpeting looks great and keep the runner. Try some brighter light bulbs and see if that makes a difference for you. Also, pick up the carpeting and runner colors in a floral display in the hall. I like the carpet but you might consider painting the door at the end in a colour that matches the carpet. I like the bare floor too. I agree with #22, Stephanie Harper. Your friend could be better lighting at the bottom of the stairs and keep the runner. The first photo with more light shows off both carpets nicely and they really do work together there. But the 2nd pic is dark and then the stair carpet dies. I definitely don’t like that long stretch of wood minus the carpet. Noisy, the sounds will bounce off the walls and the dog will probably scratch the wood over time. And you don’t want another plain color. Take it from an artist who is known as a colorist, you don’t want another color, and the original was too bright and raw for the room. Work with other elements, lighting, flower arrangements, paintings? Love it without the runner! I like it better with the runner. What I have trouble with is no visible tie-in with the wall paper and wall paint colors? I like them all individually – but nothing seems to compliment the other. You cannot undo the carpet at this point, I think the pieced flooring really needs the runner – so that leaves some change to the paint and/or wallpaper. I think I would have gone for a green diamond pattern carpet that compliments the wallpaper which i really like – sigh, sorry know that is not helpful after the fact. 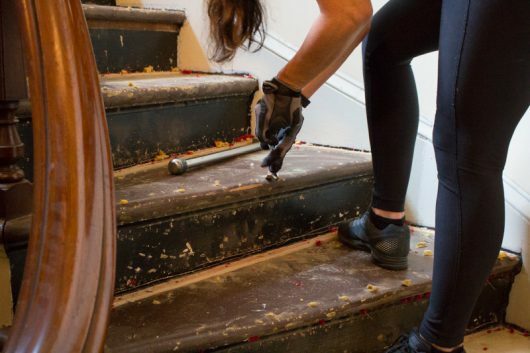 Maybe the cheapest solution is to get a new runner that compliments the wallpaper and leave the stairs out of it – after all they are tucked around a newel post. Having said that the new stair carpeting is an improvement in both condition and color, I agree that the old runner now looked somewhat mismatched. However, your home is more than a showcase, it is also a place of comfort. . I think that you will miss the comfort and practicality of a runner, especially come winter. Seeing that it may be difficult to “match”, I would look into making a runner out of the new carpeting material;( a plain color shows too much dirt. ) Think of your cold tootsies in the winter !! Hello Kevin, it is a pleasure to watch your home evolve. As I look at the pictures it seems as if the stairway settles into the background instead of inviting someone up I’m inclined to think it may have to do with light.. The red seemed to glow with light and draw attention to the staircase, while the new color seems to have more shadows so my attention is drawn to the picture and door. Perhaps it is simply the time of day. You might consider additional lighting. (Perhaps an unique chandelier) Both are great looks. It really depends on what you want to stand out or draw the eye. I will admit I was surprised how much the pattern toned down the color but you will love how it hides the “stuff”. The darker red is more attractive, and definitely better without that runner. You might consider buying a runner of the same carpeting. Nicely done! The stairs are lovely, and you’ll come to appreciate the new carpeting more when you realize that you’re vacuuming less. I’d get a new runner for the hall, either made from the same carpeting or picking up the colors. First impression for me was positive. My eye was directed at the staircase – it is magnificent and dramatic! Then I realized from reading u got new carpet. I think it looks much better than the theatrical red and again makes you focus on the staircase. The look without the long rug is much cleaner but your floors will take a beating from the traffic! At any rate – I give a thumbs up on the new carpet. I really like the new carpet, and maybe do without a hall runner for awhile. The floor is beautiful. If it’s your entrance, just put a small rug at the front door that matches the stair carpet, and enjoy the wood floor. Hummmm, I like it either way, with the runner for a change and without the runner for a change. The runner will help with wear and tear on the wood floor though. I do like the new staircase so much better than the red. I love the new carpet on the stairs, and I would keep the hall runner. 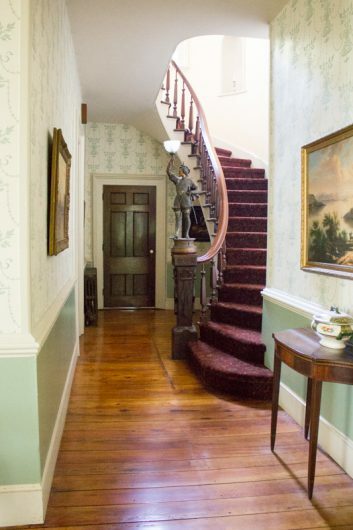 It is not only more formal (in keeping with the staircase, wainscoting, and panelling), but it disguises the patch in the flooring that goes from the bottom step to the door at the back of the hall. What was there originally, I wonder? It looks better than the former red one. With the hall runner it looks much better. You will like it in time but it needs something on the floor to make it look a bit brighter. As stated above a runner made of the same pattern will look good as well. I like the no runner look! As does Muttka! For what it is worth I think it looks very elegant with no runner but you might consider having a small rug made of the same carpet to put in front of the front door. This would save some wear and tear on your wood floor! As a Senior who has become prone to very bad falls, I applaud your foresight in opting for fully padded and carpeted stair treads! From my own experience I can reassure you that Bad bruises mend much faster than broken bones, or worse. Better lighting would also help reduce falls, as well as show off the lovely new carpeting. A chandelier or wall sconces would work well. I love your new carpeting! To me it suits the decor and architecture better than the screaming red carpet. I would think a new hallway runner would protect your beautiful wood floors (personally I have found doggy toenails are NOT wooden floor friendly!) and could be either plain, in a color complementing the stair carpet, or of the same material as on the stairs. Beautiful! You have such a lovely home, Kevin! Beautiful! I don’t see any objection to old runner. You’re experiencing a shock from bright red. I think if you cannot accept it in a couple more weeks, you could get a runner of the stair carpet. Don’t get a solid color..shows every clump of dog hair or stain and competes with the gorgeous stairs. As a bruised and stitched one who fell this week and landed on hard wood of furniture instead of the nice padded carpeting, have a runner, and always carpeted stairs. Some of us need padding! Always give any change some time to make judgement. I really like the new carpet better than the old – I like texture and the solid red was just too plain for me. I was going to suggest changing out the floor runner and then read and saw what you did. I agree 100% Given some time, you will be able to pick a new one or leave it wood – which is beautiful, also. Good luck and I’m making your waffles this Sunday. YEAH! There’s probably hundreds of ways that would’ve looked great. But ya had to choose ONE and I think it looks great especially compared to the old! I like the runner there. What about having a runner made that is from your carpet, so it would match exactly? Your eyes go to the floor and then over to the stairs without the runner. Just my opinion of course! Much happiness to you and Mr. Fox and Muttka! I love the new carpet on the stairs, very fitting for an older home. The former carpet was definitely out of place. And I think if you put down a runner, it will distract from the new carpet. And wood floors in an older house should be shown not covered. Happy birthday to Mr. Fox – give your puppy a kiss from me. The clear red brighter stairs and the darker heavier ground made a ‚light‘ impression: A darker heavier an calmer ‚Basis‘ from where the brighter and lighter stairs went up, up into the light. Now the situation has turned: The now darker, heavier stairs seem to ‚ fall down‘ and downstairs there ist no ‚powerful‘ colour to hold or to stop them. They fall fall fall fall down infinitely. Heavy. Dark. Even the light green walls can‘t stop them massing in the floor. Hélas – what to do? I hope I could find the right words to explain my impressions and mybay they are kust the same as your uncomftable feeling. The carpet is lovely and it certainly was a lot of work to replace the old one. Now that it’s in, it would be a shame to replace it. I get it. You loved the old carpet, but the old carpet was old. If you only replaced it because it was threadbare, that would explain the disappointment. browns, and muted green equals an overall color that is a third new color. And that is dark, muted red. So, now the light will have to come from somewhere else. Can you stand the thought of a different color on the walls? Something that resembles butter pecan ice cream? There are many shades in that family.. If all else fails, perhaps it’s time to get some wall lighting. We can’t have you falling down the stairs, Kevin. 1)	They don’t clash, the designs complement …. it’s called eclectic, not matchy-matchy. Now they just need to be decoratively tided together, e.g. use both shades of reds and the hall green in a floral arrangement for the hall table or maybe add a hall tapestry hanging or something else to train the eye to accept both reds. 2)	As for color shade, there is always a nap in any weave, and perhaps the stair carpet was installed in the opposite direction of how the swatch was displayed. Hence, this might be corrected with changes to the light source direction. For one, maybe it is possible to add a larger wattage light bulb to the Newel post statue light fixture. More light would show off those unique and beautiful balusters and handrail, which wasn’t even noticed before with that old “bordello” red, which all one could see. 3)	Of course a runner is needed. It’s what finishes it off with class and keeps the floor from looking bare/naked. After all, there seems to be a patch job in the wood line up and a runner covers it up nicely. And, pay attention to the direction the runner is placed because of how the nap direction brightens or darkens the look too. This may be an odd idea, but perhaps have the runner be “seasonal”, present for the fall/winter and up during the spring/summer to “lighten” the look! Happy Birthday to Mr. Fox! Kevin, I came back to this page for a second look, after giving myself some hours to digest the big change. I enlarged the photos to fill my screen, which made them more life-like. Turns out I not only love the new carpeting, I also love the way it looks with the old runner! The colors complement each other perfectly, the dark red is pulled through the room instead of stopping short, and the floor looks complete. I’d be interested to know what you think after living with it a few weeks. A new idea: The weight of the light wall color and beautiful wall paper is next to a massive stair way with a very heavy color and heavy with print rug now creates imbalance. If you use a darker green print for the runner to anchor the green in the hallway… perhaps the transition will be smoother if you keep the stair rug. I think you need shimmering crystal lighting to brighten up the hallway. The colors of green and contrasting burgandy will show up more. Consider a subtly patterned monochromatic use of carpet on the stairs to offset the warm wood tones in the hallway. That way warm and cool areas are clear to the eye. Crystal in the hallway will brighten everything as well as showcase all the elegant color, art, and pattern in the beautiful wall paper and the rich woodwork. The grand curving banister will become center stage as its elegance demands. Now the heavy carpet gets all the attention. Decide what you want to be the star of the space and plan accordingly. You don’t have to have opposites on the color wheel to create a breathtakingly beautiful space. Your instinct will guide you once you decide what to showcase. New carpet on stairs is great and fits in your house and goes with hallway runner. Added or stronger lighting would be helpful. As would changing paint color of lower walls in hallway. The paint color and your new carpet are of the same value in color intensity. Punch up the paint color and I think you will feel differently. Or alternatively if you want the stair carpet to be the focus choose a less intense paint color. It’s rich and it’s elegant! What more could you ask for? 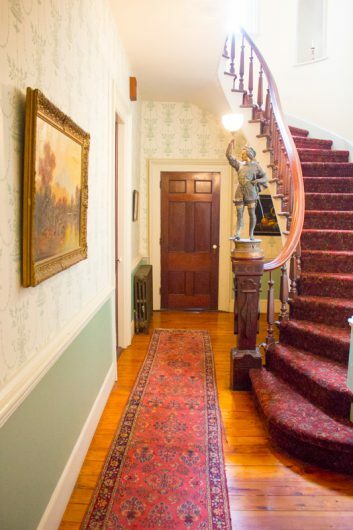 Perhaps just one tiny addition…if there was any carpet left …it would give the illusion of the stairs flowing into the Hall if you could cut a cresent shaped ‘throw rug’ ( have the carpet company edge it for you) and put it at the very base of the staircase. That would help break up the long hallway and certainly bring the gorgeous staircase right into the Hall without the need for a runner at all. The hall needs to be softened a bit and the stairs end too abruptly …plus your darling furbaby would look adorable laying in the throw rug. I never give advice, only my opinion …and you did ask! The carpet doesn’t look too bad. I think you need to get used to it. How about staining the door and the little table a redish shade? And maybe the stairs railing?? I think that it is the green on the walls and the carpeting doesn’t “flow” to me. But I am no decorator. It doesn’t seem that the green on the carpet is picking up the green on the walls. But you have a beautiful beautiful home. Love the new carpet, I appreciate it’s door look. The bright red seemed a bit out of character. And, I agree the look is much better without that particular runner. Having said all that, I know how photos can be deceiving, and anyway, it depends on what you like! My personal comment will be: Why is the wood panelling on the entire floor not running parallel with the length of the hallway? New stair carp looks drab – but maybe it’s just the camera! The close-up view of carpet shows a more energized color/pattern, which does not seem to be evident from a distance. And you should return the rug runner. It anchors the foyer and gives the room/area importance. Paint below the chair rail with the ivory on the trim. Green does not work at all! A neutral runner would look good too ( seagrass? But dogs love to use it as a toilet) if you feel you need one. The poor floor repair would drive me nuts… of course that could be fixed when Budget and psychic allows. What’s done is done – so time to make the best of it!!! I would return the runner (it hides that seam in the floor) – and maybe get some lighting going at the bottom. The close up flash picture looks good. I understand the disappointment of something not working . The new carpet is rich. I have appreciated the idea of a dark green runner and the ideas from Germany. It is worth taking time to play! I know that it will work out eventually. All the best in the meantime, with patience! Forget the runner. The wood is beautiful. Why not have a runner made of the same carpet? I love the wood floors; celebrate them, don’t cover them. And until (if ever) you’re ready for a new wall treatment, try putting a tall floral arrangement with the rich burgundy and soft green colors on top of your exquisite demilune table. Why, even a gilded gold vase would compliment the framed artwork across from the staircase. Then you have wood, gold, burgundy, and green, all of the color elements that are already in the room. Good luck. I live in a mid 1800’s farmhouse in Ohio. Each time I make a change, I stew and stress over it, convinced I’ve ruined my old house forever. You are smart…you let the house talk to you. And they do have a voice, don’t they? New carpet is definite improvement over old. As I was looking at the pictures I was going to suggest switching out the runner. 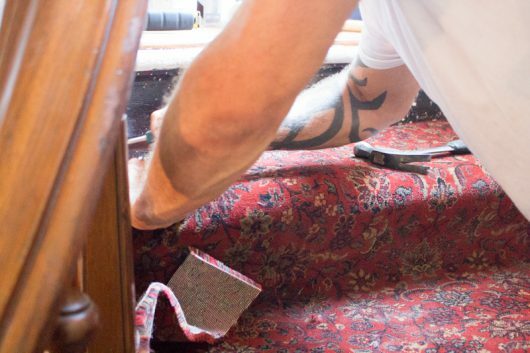 Do you have any pieces of carpet left over that could be used to trim a plain runner, maybe just on the narrow ends? A modest sized carpet at the entryway (to catch dirt) might make a runner unnecessary. I like the way the new stairs look, but I might have trouble seeing the edge of each stair. What about getting someone to make y’all a runner out of the same carpet you carpeted the stairs with. I like the change to the stairs, I think it is a vast improvement over the red. I love the color red and have pops of it all through my home, but as much as you had on that star was a bit too much in my opinion. It did nothing for the star. The stairs now have an elegent look to them; more fitting with the bannister and the winding way the stairs go up. I can just picture Scarlet of Gone with the Wind fame, coming down those stairs in her big skirts. There is romance in the staircase, but I think the entry way below needs something though. Maybe a pick one of the minor colors from the pattern in the stair carpet and purchase a solid colored runner. In my opinion due to what looks like a repair or add on to the hardwood, a runner would make the area look warm and inviting. The stairs are gorgeous, but something is bothering you about that space. This is not an unfamiliar sensation for me, as twice I’ve had to hire a decorator to drop by and sell me a couple of hours of her time. Both instances put me on a much better path so that further decisions were easier. Either way, the stairs are lovely! I’ve never felt compelled to post a comment on your blog, but I must weigh in. The new carpet looks fabulous, I do prefer it over the solid red, and the installation is SUPERB. I love the runner in the Hall and also love the bare floors (heart pine? ), so you can go either way or add the runner for winter warmth. Thanks for the referral! Well….that’s why people hire good interior designers. We save you time, money, and agony. I love the new carpeting on the stairs. Simply elegant! I actually liked the hall runner also. I would put the runner back down or have a runner made out of the same carpet as the stairs maybe with a contrasting border color. Some changes just take a little time to adjust to. Hello Kevin, well done! Your stairs look gorgeous. What would it look like if you had a runner made out of the same carpet ? Would it look too much ? Just a thought ! Have a gread day . Try a bright red runner. Really love the look without the runner, and it seems to make the area even larger. Much prefer the new carpeting compared to the old! 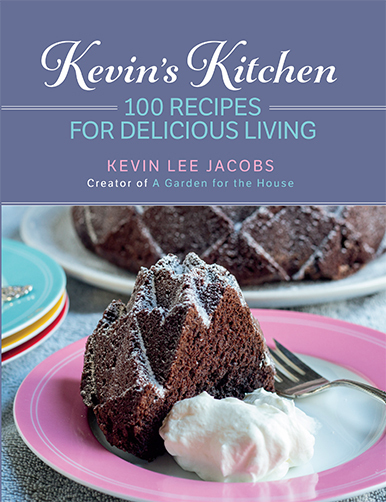 Am sure you will come to love it, Kevin! Okay,I like it much better without the runner. Now my taste runs a bit eclectic and I might punch the hallway up with a stool with a white Mongolian fur seat as an occasional chair. If that is too wild for you you could have a more formal chair with a toss cushion in the fur. I don’y know. Something is a little ‘off.’ Could it be that nothing ties ties the colors of the carpet to those on the walls? What might a creamy yellow chiffon glaze do? Thank goodness the “bordello” red rug is gone. Like the new one. Roll up the runner and put it somewhere else. If you fall in the hall at least you won’t tumble all the way down. I like it without the runner!! It brightens up the area and shows the beauty of the hardwood floor. Looked too heavy with the runner and looked too busy. Also, makes the area look larger!! I liked the runner with the new stair carpet. I think the problem is with the colour of the walls. That should be an easy fix to choose a more compatible colour. I love the result without the runner. The bare wood is warm, reflective and historic feeling, and the stairs are set off wonderfully without any competition. Muttski will be able to go up and down the stairs well into her old age without fear of slipping, and without the embarrassment of having her hair show up everywhere, everyday. Bottom line for me, I love it. My sentiments exactly! I really like the beautiful wood but if you are hellbent on a new runner, perhaps something in a green somewhat darker than the walls. The staircase looks beautiful! I liked the runner with the new carpet. Color is 100% a function of light. 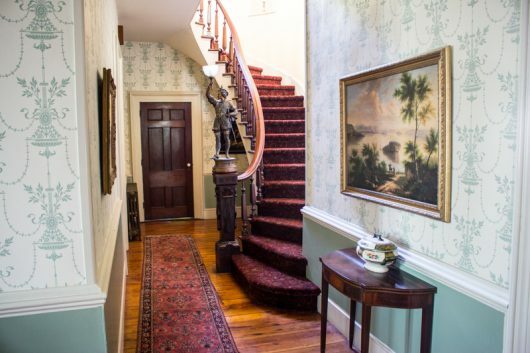 Can you get a lamp or light to help show off the beautiful stair carpet and all its detail? I’m sad that it looks a bit muddied in the photo, when the sample was so vibrant. Sigh. I like the runner and the new stair carpet together. It ties everything together and looks warmer and richer which draws you in. Without the runner it looks cold like something is missing. I love the new carpet. Looks way better than the previous one, which was far too bright and took focus away from the lovely wooden banister and newell post. Now they’re much more of a feature. I don’t think it needs a runner or that will detract from the wood too. If I were going to change anything, I’d change the mint green paint and go for more of a sage green hue, but still a pale shade. Would that mean changing the wallpaper – Oh well! First glimpse of the new carpeted stairway – sans runner in the lower hall – my reaction was “Yes! !” Sooooo much better, Kevin. I was never a fan of the bright red, admittedly, and this new carpet just makes the whole staircase so much more elegant. To me, it ties in the paint colors on the walls so much better than that red, which was jarring. To have a runner or not to have a runner, now that is trickier. I think I would roll out the old runner for the winter season and keep the wood floor bare in summer for a lighter feeling, but that’s just me. I do agree with the suggestions of more lighting on the lower staircase. That change alone might make you fall in love with your newly re-carpeted stairs which really are simply beautiful. At the top of the article I agreed with you Kevin, too dark. I’m thinking why didn’t he stop them from installing and point out the color isn’t what he ordered? As I cursed down I’m feeling so bad for you as I know the great thought you put into this selection. Then I got to the bottom and wow what a huge difference taking that runner away did! I love it! It really was just the clash of the reds that was hard on the eyes, now its a beautiful historic staircase that really makes a statement. Especially pretty with the dog, make him stay right there, lol. I think it is STUNNING! Classy and sedate…just like YOU. And I would leave the runner out at least for the summer. The floors are spectacular. Maybe you could replace it when the cold weather comes. Showing off the fabulous wood floor is the way to go. The contrast is striking. I love the new carpet and definitely love the runner with it. It is interesting to note the difference in opinions ….ask 100 people and get a 50/50 results. I think the staircase color will grow on you after a few weeks! With a dramatic change from bright to subdued, it truly takes some time to get used to the new look. The original bright red dominated the space and the runner went unnoticed. The calmer carpet visually gives the runner equal attention and your brain wasn’t expecting that. While not seeing it in person, the rug and runner seem to blend together equally and they’ll visually become neutrals in the space – monotone – and that leaves the eye to go to the artwork and the statue as it should. Without it, you may see more floor than you want – the lighting will change the look throughout the day too. The runner anchors the room. I’d leave the rug out for a few weeks as the carpet normalizes and then add it back to see if it’s too much. The carpet choice suits the home very well. with the “shocking red” who are we to judge. Without the runner it does not look finished plus wood floors get scratched by doggie paws and traffic. Try looking back at the pics and covering the solid colour on the walls with your finger. See anything? I do like your new carpet and the runner. I think you were just used to the bright red which by the way after all is said and done was like an old friend you feel you betrayed by throwing it out. Like the rug and the runner! Not so much the wall color. But I agree give it time. I think the problem was the dueling patterns in the runner and the stairs. It looks great without a runner but I think you will eventually want a runner for warmth, noise dampening, to protect the floor finish and to prevent dog sliding. I agree with the people who say to make a matching runner. Another pattern or another color will make more chaos. As an educated and state licensed Interior Designer, I just have to comment On the latestest addition to your foyer. Floors are beautiful, they give off two much gold and orange tones. And love seeing your gardens and your home. Hope my comments have helped. I think the reds are clashing with one another. The new carpeting is beautiful on its own. I liked someone’s suggestion to lay down towels or fabric where you might want another runner and try different colors. Perhaps a subdued color runner, either in one color from the rug (not red) or whatever color is opposite red on the color wheel. In hindsight, I think a solid color carpet would have worked better – something in the range of the red base of the current carpet, much toned down from the bright red original. Fix? Try a runner in a solid color, or solid color with texture that is a blue/green color between the wall color and a dark blue/green in the stair carpet. Once you figure this our, you will love your stairway again! Kevin, I think the new carpet on the stairs looks fabulous. The runner makes it look a little busy, however I love your wood floors, they have so much character. Think the stairway carpet needs the runner for balance. The new carpet is rich and gorgeous. I think that you will miss a runner and the new runner that you choose must unite the walls and the new carpet. I am thinking a beige or the green of the walls that contain the colors from the stair carpet-or a natural jute or sisal. Whatever runner that you choose must be carefully selected to unite As always your taste is impeccable. I love the runner and stair carpet but the green on the wall is awful and is so distracting with the beautiful carpet. I restored an 1859 stone farmhouse and left the stairs bare after restoring the color on the flat steps and painting the risers white. I used a runner like yours on the floor after restoring the hall floor AND I did the walls off white and used various pictures ( all ark pictures) throughout the hallway and up the stairs. The white walls were perfect and seemed to be the perfect choice. I am sorry but that green has to go!!! I love the new carpet. It’s much better than the old carpet. I think you just need to get used to it. I like it much better than the bright red; it is calmer, humbler, much richer and definitely Victorian, especially with the hall floor bare. Thanks for sharing. Kevin, I love it. Very elegant and appropriate to the period of the house. Easy to maintain. Over time I think you will grow to love it. Wooden stairs, although beautiful, do not go well with aging people or animals. Besides, they are noisy. I much prefer the new carpet. It will wear better and enhances as opposed to dominates. Hope you will come to love it! I am late to this party. You have invested in a beautiful rich carpet ,so I think it has to stay. You probably are not inclined to re wallpaper as that is a big project. I think you can paint over the mint green lower wall with Benjamin Moore Ivory Tusk semi gloss finish and save the day. I would then pair with a jute runner. Voila! Wow, people have a lot of opinions! I honestly think it’s just a readjustment to your eye of not having the vavavoom of the stiletto red. (Might not even notice in a month.) In the pics I just read the difference of the rug and carpet as naturally occurring between incandescent bulbs and daylight through the window. I think you should only replace it if you find something you adore otherwise you might be in a similar outcome of feeling ho-hum about the results. Hi Kevin! I commend you on ALL your renovations! They are Daunting, and yet you DO IT! I LOVE THAT! My best recommendation would be to consult with a decorator/designer. We did that when we moved into our “handymanfixithome” and we are definitely NOT handy-ANYthing! The decorator gave us three options to choose from after we explained our colour and style choices, and 20 YEARS LATER, we just keep touching up the same colours over and over again, because we just LOVE the way it looks! I would suggest just trying a new colour in the wall below the wainscotting to pick up the dominant colour of the stair carpet. Granted, you have the colours of the wall in the carpeting, but they don’t POP enough to notice! I LOVE the carpeting you chose and I am pretty sure you will find a happy ending to your dilemma! Many seem to have the same comment as my immediate reaction to the picture. I like the new carpet. I never liked the bold red. I think the new carpet is more refined and classy. I also liked someone’s suggestion about having a runner made from the same material. Do it now while the carpet is available and they will wear together. Nothing I do in my house looks as I expected. I just try to look at what is good about it and move on. In your case, I think you are probably right on target for what the original home would have had. And it’s softer and easier to care for. That’s three! Plus it’s new and fresh and looks great. So, the only negative is your eye has not yet adjusted! It’s a win! Your eye WILL adjust! Love it! I LOVE the new stair carpet. I also think a runner from the same carpeting would be perfect. Or…you could call in a knowledgeable oriental carpet dealer to give you suggestions for a new runner. They have an eye for what goes with what, both color and pattern. The dealer might surprise you with a totally different look for the runner as a contrast from the stairs. Good luck! The new carpet on the stairs looks stunning and very sophisticated, in keeping with the stunning newell post.I also like the hall with no runner. Recently I did the same thing in my entry hall, and after removing the runner the elegant floors showed more , reflected the light and were easier to keep clean. It is a more modern look while maintaining the historic house. The beautiful tall lamp on the stair post doesn’t allow the stairs to terminate properly on the first floor…not a good place to add height. I’d change-out the painting/print on the left wall…maybe opt for several paintings/prints to fill-up that wall and lend some compatible colors to bring-out your new carpeting. The right mirror in that spot would open-up the space and reflect back the carpeting and stairs, but it would have to be a large mirror with a nice frame to look right.